Linda: If it were May 18, 1953, you might be hearing former Women’s Air Service Pilot (WASP) and race pilot Jackie Cochran streak across the sky becoming the first woman to break the sound barrier in the Canadair F-86 Sabre jet she borrowed from the Royal Canadian Air Force, with good friend Chuck Yeager flying right beside her. Or for a more serene thought, surveying the surrounding landscape, you can imagine horseback riders on the trails leading to and from legendary aviatrix Poncho Barnes’ Happy Bottom Riding Club. Mike: From the cracked mud-and-borax lakebed I’ve witnessed rapidly descending aircraft round out, touch down, then seemingly bounce back into the air in practice landings for another legendary aircraft, the Space Shuttle, which made its first landings on these lakebeds. As a student pilot these were my landmarks on solo cross-country flights, handy for cross-checking with the boundaries of the U.S. Air Force’s restricted flight areas. The runways painted on the lakebeds look like a photo negative with their black lines on white landing strips, some of the longest in the world: Rosamond, four miles; Rogers, over six miles long. I’ve crossed this airspace hundreds of times, sharing the skies with most types of aircraft in the U.S. Military’s arsenal, always centered about those dry lakebeds visible for a hundred miles from any direction. I wish I could have landed on one. Linda: Edwards AFB with its 13 runways is home to NASA's Dryden Research Center and the USAF’s Test Pilot School. Restricted flight areas stretch from Rosamond Lake, up into Nevada's Tonopah test range, including Yucca Flats, the area used for underground testing of nuclear bombs and home of Area 51. Edwards has seen lots of aviation history in the making, and on October 1 another first will take place there: a fly-in for general aviation aircraft, complete with pancake breakfast. Pilots may enter a drawing to land on the 21-square-mile Rosamond Dry Lake. On September 10th, 100 lucky names will be drawn. Entries can be made online at www.FlightTestNation.com, but pilots must meet strict criteria, be willing to land on dry, packed mud, and be prepared for high gusty winds. Perhaps Mike will be one of the lucky one hundred, and fulfill that longtime wish. Mike: The EAA’s (Experimental Aircraft Association) very successful Young Eagles program has opened the door for that first flight for over 1.5 million youngsters. We count it a privilege when our EAA chapter puts out a call for Young Eagles pilots because that means there’s another opportunity to introduce another young person to the wonderful world of flight. Our most recent trip to Brenham with several other chapter members and Young Eagles first took shape with a special family. The parents whose second son was diagnosed with a degenerative disease which will take his eyesight within a year are on a quest to provide him with as many experiences as they can while he still has sight. Once the request was circulated among the chapter members, everyone with an airplane and availability jumped at the chance. Grant, an air traffic controller who flies a Piper Cub, Jim, a flight instructor who has a Luscombe, our chapter president, Phil, flying a Cessna 172, and us, in a Piper Arrow, met with the young boy and his family at the West Houston Airport on a Saturday. The boy, his older brother, and a teen-aged girl would lift off West Houston’s runway into a light breeze on a hot day, banking northwest toward Brenham for a taste of the goodies found at the award winning Southern Flyer Diner. Linda: Since the teen-ager would fly with us, we rented the Arrow for a little more room than our sporty Cheetah would afford three adult-sized people. With Mike riding in the back, it was chick pilots all the way. At 16 my co-pilot already knows she wants to fly. She’s been bitten hard by the aviation bug and is urging her dad to hurry up and finish his project. He’s building a Cozy, an airplane in the Experimental category. Seems his daughter just can’t get enough of flying and when we landed at Brenham she was eager to go back up right away. The two boys were thrilled with the adventure, excitedly telling their mom all about flying as they joined Grant in a booth at the diner. The round trip gave the brothers a chance for each to ride once with Grant and once with Jim. Grant’s open-door Cub provides an awesome view with the added benefit of feeling the wind wisp past the little Cub. Mike: Our EAA Chapter 12 is based at Ellington but our next big shindig is this Saturday, from 11-3 at the West Houston airport. Chapters from Waco, Dallas, and San Antonio will be joining us as we celebrate 55 years of Chapter 12. That makes us one of the longest-running chapters in the country and from what I understand the oldest in Texas. Chapter 12 boasts many astronauts as members, probably more than any other chapter since Houston and Ellington are home to NASA and the Johnson Space Center. Our Guest of Honor on Saturday is none other than a most distinguished former EAA Chapter 12 member, Gene Kranz. Retired from NASA, Gene’s accomplishments include Assistant Flight Director during two Mercury missions, and three Gemini missions, Director of another Gemini flight and Apollo 7, 9, 11, 13, 15, and 17, and eventually the Director of NASA. You likely know from his book, “Failure is Not an Option,” that Gene is one of the heroes who made the successful recovery of our Apollo 13 astronauts. Come join us for cake and ice cream. Linda: The concept of the flying car has been a dream of entrepreneurs for ages. Several varieties have been created, some amusing, such as the Mizar Flying Pinto with Cessna Skymaster-like wings and tail (1970's), and others showing commercial potential, such as Terrafugia’s Transition. Inventors have mostly focused on developing a multipurpose vehicle for more advanced societies. I'm a bit skeptical on their practicality, though. While in car-mode a parking lot dent might render the vehicle non-airworthy, its value declining instantly. And, in these grossly litigious times, who would insure it? They say necessity is the mother of invention, and evidently there are people who deem a roadable aircraft a necessity. Is it? Let's be realistic. Everything here is temporary. You, me, our cars, our airplanes. What if we went beyond temporary? Enter I-TEC Founder and CEO, Steve Saint, inventor and builder of the Maverick Sport. http://www.mavericklsa.com/. This is not your grandfather's roadable aircraft. This incredible vehicle was created to carry the message that has eternal consequences - the Gospel of Christ. Mike: I-TEC (Indigenous Peoples Technology and Education Center) was established to help indigenous churches overcome technical and educational hurdles that stand in the way of their independence. Check out http://www.itecusa.org/. Born to a missionary family serving in Ecuador, Steve earned a degree in Economics from Wheaton College in Illinois and became a successful businessman, enabling him to continue supporting missionaries and make occasional mission trips back to Ecuador’s indigenous people. But something always called him back to aviation, something, you might say, he inherited from his dad, who was also a pilot. Steve learned it was vital that the tribes choose their way of life and how they would shape their culture. Teaching and providing means for less dependence on outside aid would bolster their sense of dignity and allow them to set their own course. 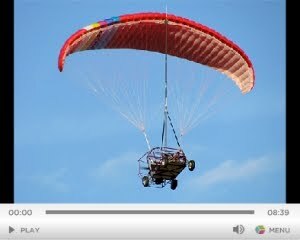 Linda: So this year Steve Saint brought his Maverick Sport from Florida to AirVenture in Oshkosh, Wisconsin, the event where major aviation announcements are made and new products introduced, and showed thousands a whole new take on the flying car. The Maverick Sport drives like a dune buggy, has an airboat propeller on the back, and deploys a parachute-like wing supported by a mast. It flies like a plane, carries up to 550 pounds, and will be certified by the FAA in the experimental category. As exciting as this invention is, the rest of the story will move you. It is one of high personal cost, sacrifice, and forgiveness. In 1956 five-year old Steve learned of the murder of his father, Nate, and four fellow missionaries by the Woadani tribe in Ecuador. Because the surviving missionaries continued to evangelize to the tribe, by the time Steve was 10, he was living amongst and was baptized by the very people who took his father’s life. Saint is especially close to Mincaye, one of the tribesmen who killed his father. Today, Steve and Mincaye speak together about God’s love. Steve’s Aunt Rachel continued the mission for many years and when she moved to Heaven the Woadani asked Steve to return to them. He did so until he felt his presence was interfering with their spiritual and economic growth, realizing the kind of help they needed, which is when he started I-TEC. Perhaps you’ve read the book or seen the movie, End of the Spear (http://www.endofthespear.com/). I-TEC, and the Maverick Sport, are some of the good God has brought out of evil. Mike: I began last week telling you of my visit with the Mitchell family of M & M Air Service in Beaumont, a very important part of Southeast Texas history, including Liberty County. Crop dusting has changed over the 65 years M & M has been in business. Better education improves safety, too. Ag pilots receive considerable training and continuing education; a minimum of 20 units in the areas of pesticides and chemical applications every three years. Annual safety meetings and daily briefings are additional requirements, and special courses offered at conventions earn them insurance discounts. These days pilots load “shape files” of fields directly into the airplane’s onboard computer system. With the ability to exclude an area from spraying, the pilot creates a flight plan. They may fly a race track pattern or parallel rows as they did when flaggers were employed. A data logger tracks the plane’s actual flight, heading and altitude. That information once downloaded, becomes a permanent record of what was actually sprayed. Another long time employee, James Fanette, began his career with M & M cutting the grass, then worked as a flagger, loader, and eventually a pilot. Following that he became their aircraft mechanic and inspector. James retired two weeks ago after 43 years with the company. M & M now has nine airplanes, various models of Air Tractors, manufactured in Olney, Texas. Three are aerial firefighters in west Texas, two spray fields in southeast Texas, another is fertilizing timber throughout several southern states while others are spraying corn in the Midwest. Among M & M’s customers are the U.S. Department of Interior, Texas Forest Service, Bureau of Indian Affairs, and the Bureau of Land Management. They also spray local area counties for mosquitoes after hurricanes and reseed burned areas for the U.S. Forest Service. On a recent trip through Hartsville, South Carolina, David Mitchell met a pilot who said, “Are you from M & M? You gotta see this.” He opened the hangar doors and David says, “There was one of our old Stearmans, nicely restored.” Another of their Stearmans is still working fields in Sumter, South Carolina. You can see their #21 Stearman, the first airplane in Texas to sow rice by air (April 9, 1946), in the Chambers County Agricultural and Historical Museum in Winnie. Their #34 Stearman was donated to the National Agricultural Aviation Museum in Jackson, Mississippi. The last Stearman M & M owned was used for training until it suffered heavy damage from Hurricane Ike. Now completely restored, their sole Stearman will once again be ready to train another generation of M & M pilots. Mike: “April 9th, 1946! That’s the day aerial seeding of rice fields in southeast Texas began,” as told to me by George Mitchell, second-generation manager and president of family-owned and operated M & M Air Service, “…and it has been here ever since!” Founded in Beaumont, Texas in 1946 by Poley and Fields Mitchell and Gilbert Mapes, the Mitchells purchased Mapes’ share of the business a year later, and now M & M Air Service has been serving the farming communities of southeast Texas continuously for 65 seasons. George, Fields’ son, took over as manager in 1966. George and Gail’s children, Paul, David, Mark, Lisa and Andy are the third generation of M & M. David and Mark both hold positions as vice-presidents with responsibilities for different divisions of the company. Lisa’s responsibilities include accounting and payroll. Andy is an agricultural and single-seat aerial tanker (SEAT1) pilot with experience in all areas of the company’s operation. Paul passed away in 1993. Back in ’46 the company bid on 200 government surplus Stearmans and were awarded 42, for which they paid a mere $56.56 each. They re-configured most of those airplanes for aerial application of wet and dry materials. When M & M began, rice production covered 150,000 acres in southeast Texas and the airplanes took to the air before sunrise, operating until well after dark. For 20 years, M & M operated up to 33 Stearmans and never left the Tri-County area of southeast Texas. Those 33 Stearmans flew only six months out of the year, yet flew an estimated 1.5 million hours. A Stearman can haul about 1,400 lbs. and can fly pretty slowly. To reduce time between trips, each farm had its own air strip. George says there were 172 air strips on farms in the three counties. “We called them Stearman strips,” he says, “because the Stearmans didn’t require that much runway to get airborne.” One day, George Mitchell and Henry Morrison flying two Stearmans broke the record for the number of loads flown in one day: 197 loads. Today the area’s rice production has dropped to 25,000 acres and like many businesses M & M has had to change with the times. “For 20 years rice was 100% of our revenue. Now it’s only seven to eight percent,” George told me. Diversification has been the key to survival. They began brush control flying in west Texas and far west Texas, then added a ground spraying business with a John Deere rig. Forestry fertilization for private forestry producers came next, followed by aerial firefighting. In addition, George says costs have skyrocketed. “Since 1946, the price of airplanes has multiplied by 10,000. The last airplane we purchased was $565,000.00.” Today the family business continues with nine Air Tractors. We’ll talk more about M & M’s current operations next week.